I am not sure I made the right move, but I volunteered to be room mom for both boys this year. In one class I am merely a helper, and in the other I am co-leader with another mom. Thank goodness I found another mom to lead with as I am not sure I would have been good at going it alone. This new position is in addition to the many jobs I already have going, as well as trying to gear up for the Waytonka Marketplace Gift Show this November. Hmmmm. Seeing that my last post was mid-September, I see my ability to multi-task is quickly dwindling! At any rate, today I have been diving into Pinterest as well as Google for some creative ideas for the boys' upcoming Harvest / Fall Parties. We all know what a huge time-sink those sites are, right? But I have found some fabulous ideas that I just have to share. 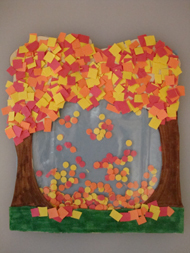 Perhaps with this post, you'll be able to follow suit for your classroom fall party this year, and not have to go all over the internet to locate ideas. One stop here and your party could be done! The boys' parties will be the first week in November, so I am attempting to keep the party ideas themed more toward fall, autumn, harvest and will maybe throw a little Thanksgiving in the mix. With crafts, games and food, we have a lot of ground to cover. I'll do them in separate posts so as not to overwhelm you all at once. See how considerate I am? 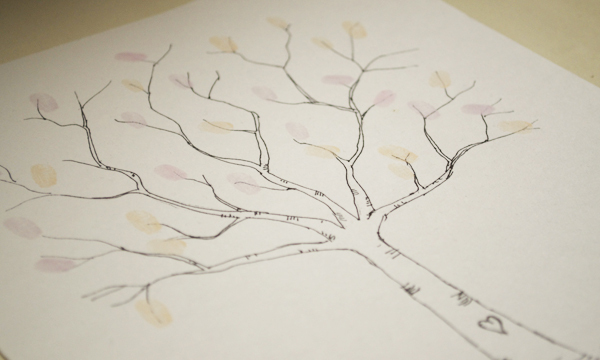 Sue at One Fab Day has a free Fingerprint Tree Template that you can download and print out as many copies as you need. Even though her site is mainly wedding-oriented, I think this would work famously with fall-colored ink pads and tiny fingerprints of Kindergartners and Second Graders. 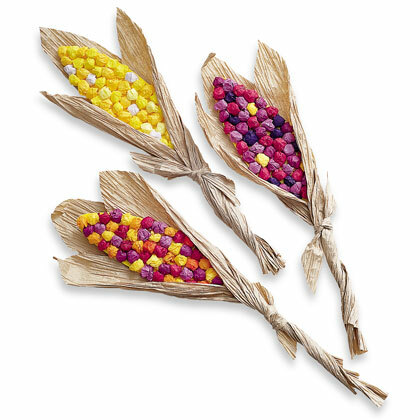 Disney's Family Fun site has great, easy-to-follow instructions for making this adorable indian corn from raffia and tissue paper. I think the kids would have a "ball" rolling up little tissue balls for this. Get it? (Yes, I am a dork.) But then I wonder how Kix cereal dyed with food coloring might work...? Don't the balls kinda look like cereal? Would the cereal even make it on to the raffia? 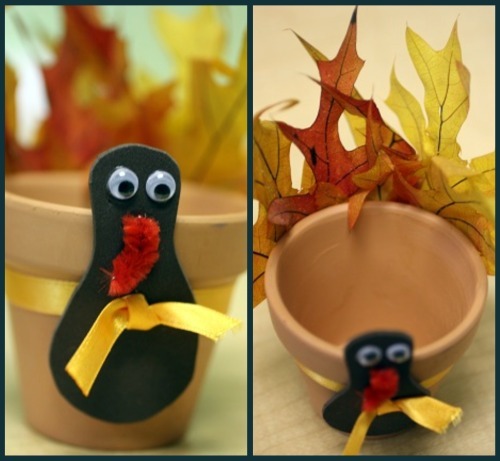 There aren't specific instructions for this little cutie, but what a great idea! Balancing Beauty and Bedlam got it from Rebecca I think. Take a simple small terra cotta pot and adorn with artificial fall leaves. Cut a drumstick shape from craft foam, affix google eyes and clipped pipe cleaner to make Mr. Turkey. Then punch a hole in his body. Wrap the ribbon around the pot and string through Mr. Turkey to keep him on. (At least I think that's what it looks like happened.) The kids can bring him home and he could be used at the Thanksgiving table as a place card, a spot to hold crayons for drawing while waiting for the big meal, or as a snack bowl! Lots of possibilites for him. Aren't these just the cutest little guys you've seen? 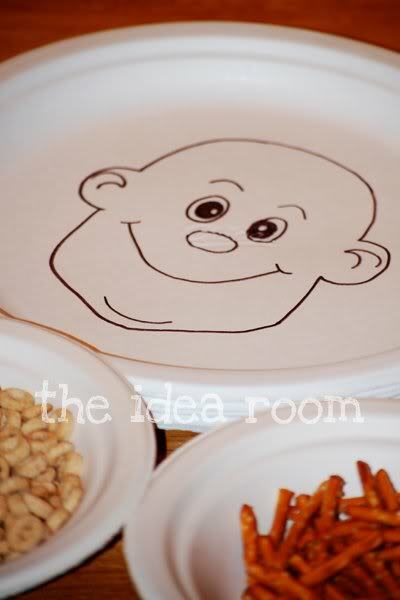 Multiply Delicious hosts this fun craft which keeps the kiddos busy. They have some great photos and super instructions. 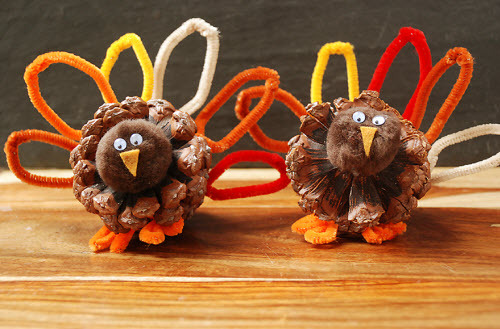 If your school or home is in an area abundant with pine cones, you could even start the craft off by going on a pine cone hunt to find just the right one for your turkeys. These would also be darling place cards for the Thanksgiving table. Amy over at The Idea Room came up with these funny face plates after seeing other versions in stores. (They remind me of those magnet platforms that had the tiny magnet dust you could move around to make beards on the face. Remember those?) Using simple paper plates, a Sharpie and some dry foods, you can (if you're as old as me) go back in time. I would have the kids glue their food on so they can become masterpieces in their family gallery. Too funny and would make excellent conversation starters, don't you think? Come back for the next installment - activities and games!